Though most programmers use two or more languages, they usually have a mastery of one. Although Microsoft has advertised that the .NET runtime is language agnostic and that C# and Visual Basic .NET are so close that switching between the two is really quite easy, that?s only true up to a point. Some of the differences are obvious, but others are very subtle. 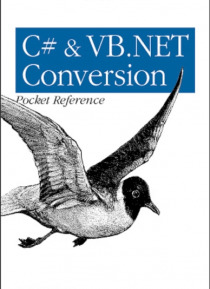 C# & VB.NET Conversion Pocket Referen… ce helps you easily make the switch from one language to another.The differences occur in three main areas: syntax, object-oriented principles, and the Visual Studio .NET IDE. Syntax concerns the statements and language elements. Object oriented differences are less obvious, and concern differences in implementation and feature sets between the two languages. IDE differences include things like compiler settings or attributes. There is also a fourth area of difference: language features that are present in one language but have no equivalent in the other. These unique language features are also covered in this book.C# & VB.NET Conversion Pocket Reference is a perfect companion for documents and books that don?t have examples using your mastered language. Author Jose Mojica expects that you know one of the two languages, but does not make anassumption about which one. He presents the information in alanguage-neutral point of view so that programmers from either background can read a section and feel that it is targeted to them.